Mission: We prepare men and women for any tactical profession requiring a fitness test and advanced training. Your fitness level may one day be the difference between life and death. It pays to fit fitness into your schedule. We at StewSmith Fitness help you do that. 1 - Do all of the services have their own academy? If so how do you get into them? This is a monster of a question so I recommend thorough research on the websites of the Service Academies below. All services have their own academy however the US Naval Academy has around 20-30% of its class to join the Marine Corps. All academies take a pushups, situps, 1.5 mile run every six months while attending the 4 year school. However, West Point - (Army) does a 2 mile run. 3 - What is up with the basketball throw - where did they get this test? Ha - good one. It is actually part of an older exam called the PAE - Physical Aptitude Exam which basically measures one's potential to be a strong candidate / athlete. The test does demonstrate athletic ability to a degree and shoulder girdle and torso rotational power as well. I agree it is a bit different from ALL tests out there, but the Army, Navy, AF use it so who am I to argue? 4 - Can you fail the CFA? Well, since the academies are very competitive, it helps to have good to great scores in EVERYTHING you can to set yourself apart from the other 10-12,000 or so applicants most academies receive. Notice - there are no minimum standards! I love this personally as striving for a minimum standard CANNOT be a part of your work ethic IF you want to get into and especially if you want to graduate. 5 - On average what are the numbers who apply / get accepted / graduate? 6 - How do you become a Marine at the Naval Academy? As with any service selection opportunity, you will be given a course to follow through your four years there that can take you directly to the graduating ranks of the USMC. Usually, it requires a few summer training periods with Marine units, attending a summer program for midshipmen seeking USMC officer slots at Quantico, VA, taking the USMC PFT - pullups, situps, 3 mile run and of course keeping up with your academics and leadership experience positions as it is competitive to become a Marine officer. Also you will have to endure a 24-36 hour event called BUDS Screening which is run by the SEAL instructors at USNA and actual first phase BUDS instructors - basically it is all the tough events that occur during the six months training at BUDS compounded into a 24 -36 hour period. This gets you a ticket to go to the SEAL Officer Assessment and Selection the Summer before your Senior year. Starting the Summer 2014, ALL officer candidates will get the opportunity to test themselves at BUDS. What used to be called mini-BUDS has been changed to an actual BUD/S Selection Program. Mini-BUDS was more of a summer camp compared to BUD Selection program as this program is not just a Midshipman Summer Cruise - it is a selection and screening course. USNA and Navy ROTC Midshipmen, qualified USAFA, or USMA cadets, and highly qualified OCS candidates all train together and are constantly screened by BUD/S instructors. The details of this program are limited and all candidates are required to sign a non-disclosure agreement. Just know that you will be tested in running, rucking, swimming, water skills, PT, log PT, small boat drills, and many more events. You will be graded at just about everything you do from push-ups to leadership skills. Interviews, psychological evaluations, and the two weeks of daily challenges will expose your personality, strengths, and weaknesses. The BUD/S recruiters and Officer Community Manager will determine who attends BUDS in the following months and candidates will learn later in the Fall the same year. This training is no longer mini-BUDS. It is very intimidating, but if you are prepared you will test out well. Relax, be yourself, show confidence, not arrogance and you will be fine. Have some knowledge of the SEAL Teams, read books on SEALs, etc as you will be asked many questions on your potential future profession. 8 - Can you join the military even if you go to the Merchant Marine Academy? YES - I know of several who have gone onto serve in the military, in fact a few have become Navy SEALs too. SEALs also have a few billets each year coming from USMA and USAFA. In fact, the COMNAVSPECWAR (1 star admiral in charge of all SEALs) is an USAFA graduate. 9 - Are the Service Academies "real" college? Depends how you define real! The answer is yes - they are accredited universities and actually very competitive with Ivy League schools with challenging curricula. Now - will you have a "real" college experience? Up to you, you get to leave on weekends and relax and have fun, but during the week, it is work - workout, go to school, do a sport, eat, study, sleep! 10 - Why did you choose the Naval Academy - why a service academy? I knew I wanted to be in the military at about age 16. I just did not know what I wanted to do. I figured if I can be in the military AND go to college that was even better so I looked into ROTC and Service Academies. After some research (before internet) I noticed the Navy bases always were near a beach. Being from Florida, that seemed nice. After pondering pilot or Navy SEAL, I eventually came to the Navy SEAL decision after meeting several of them on campus. Also five guys on my rugby team all became SEALs too. So we were all workout buddies. It just seemed to fit. Thanks for all the emails that help me write weekly articles. Keep them coming and I will answer them personally. Email me at stew@stewsmith.com for any comments / questions on fitness. Run 1 mile, shuttle run, pullups, pushups, situps, and a basketball throw. This DVD will walk you through the test and help you create a strategy for you to ace the assessment. 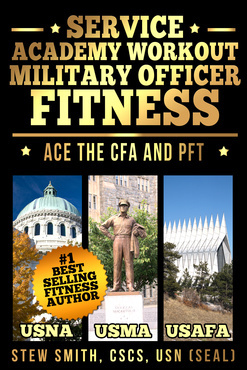 The CFA ebook is the workout and this is the video guide companion to the workout book and is FREE with the purchase of the book or ebook.